​Contact us with zip code if you need your parts faster. Also available at Amazon and ebay. 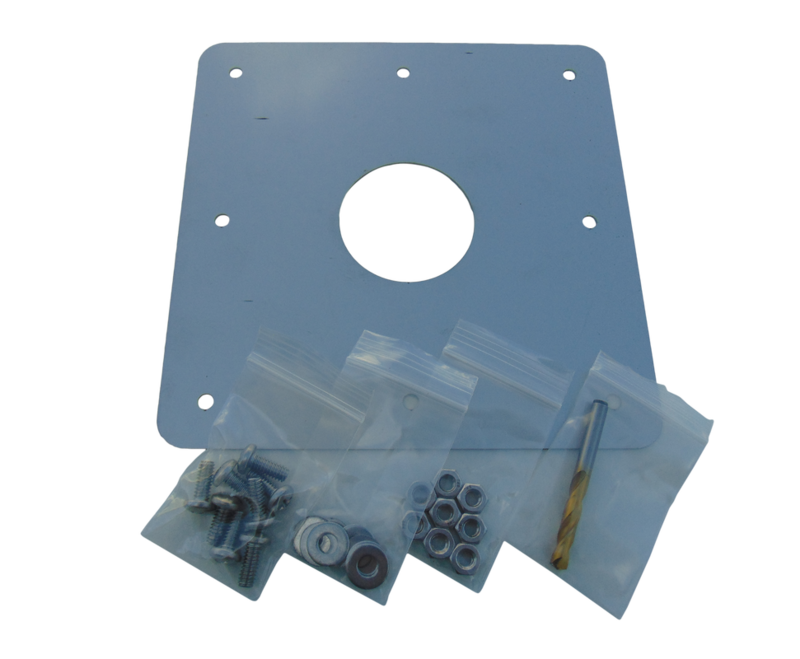 Stainless steel repair kit for standard-size skimmers : reinforces pool wall to allow attachment of your skimmer. This is the most common skimmer size. 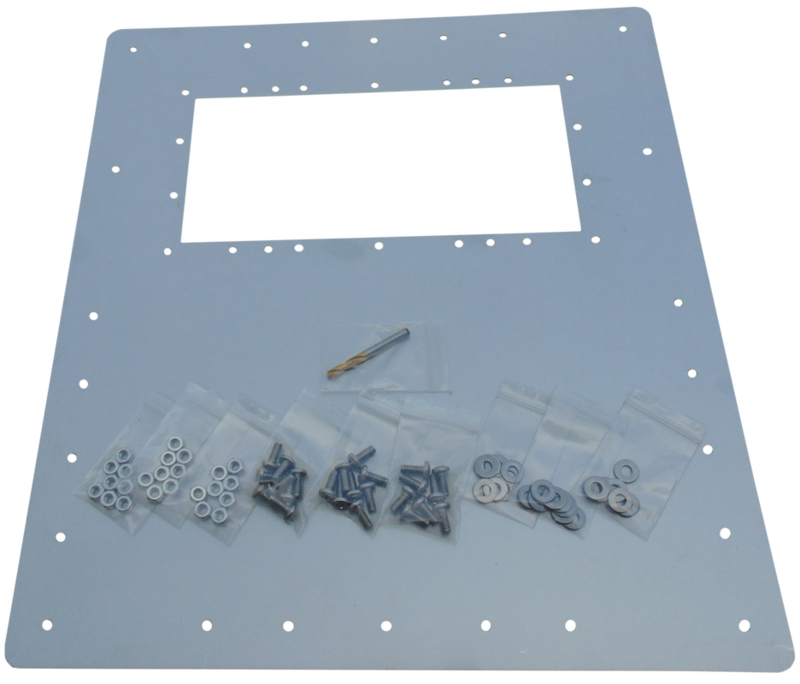 -Skimmer panel: 12 1/2" W X 12" H outside, 6" W x 5 5/8" H opening. -Compatible with: Hayward SP1091LX, SP-2094, 1094SPA, 1094H, 10950M , Hydrotools 8940. Also compatible with other skimmers with 10 screws on the face-plate. -Pre-drilled 8 x 1/4" holes on the perimeter for assembly to your pool. 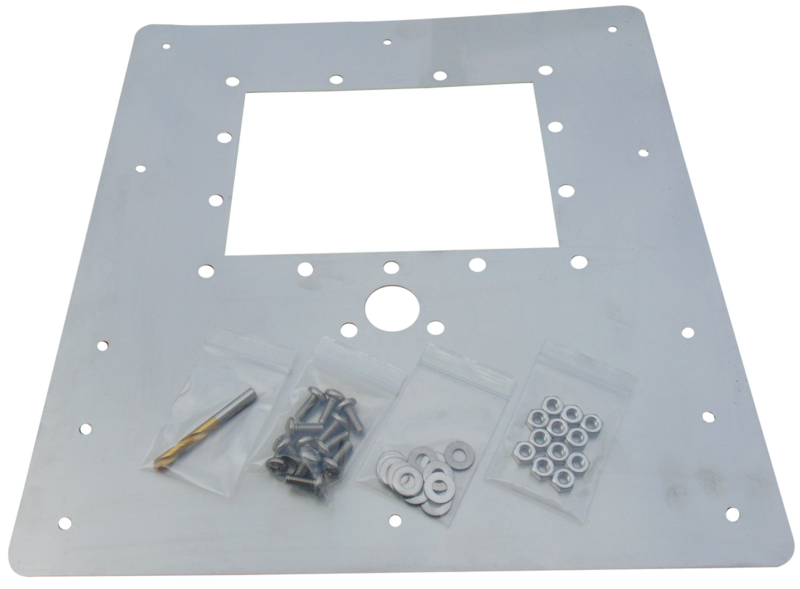 -Note: The two center holes on the sides are for attaching the skimmer to the panel prior to assembly of the skimmer face plate. These two center holes are not visible when the face plate is assembled. Stainless steel 8"x8" repair panel for pool wall around eyeball return fitting: 2 3/8" thru hole for the most popular sized outlet fitting -reinforces pool wall. Drilling a round hole thru stainless is about impossible without professional tools, so make it easy on yourself with this pre-cut panel. -Pre-drilled 8 X 1/4" diameter holes on the perimeter for easy assembly to your pool. -Compatible with Hayward SP-1091WM Dyna-Skim and Hydrotools 8939 wide skimmer. 2", 2", 2 3/8", 2 3/8", 2", 2"
2 1/16", 2 1/8", 2 1/16"
Plus size panel fits the most common standard skimmer, but is 5" larger under the skimmer opening for additional reinforcement of the pool wall. 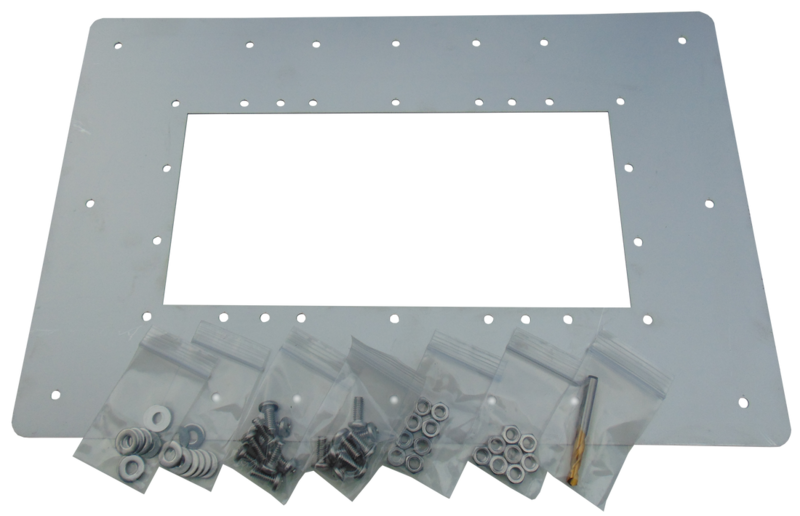 ​-Skimmer panel: 12 1/2" W X 17" H outside, 6" W x 5 5/8" H opening. -Compatible with: Hayward SP1091LX, SP-2094, 1094SPA, 1094H, 10950M , Hydrotools 8940. Also compatible with: Olympic, Aqua Leader, American Products, Pac Fab, Pentair, Swimmaster, Season Master & other 10-screw face-plate skimmers. 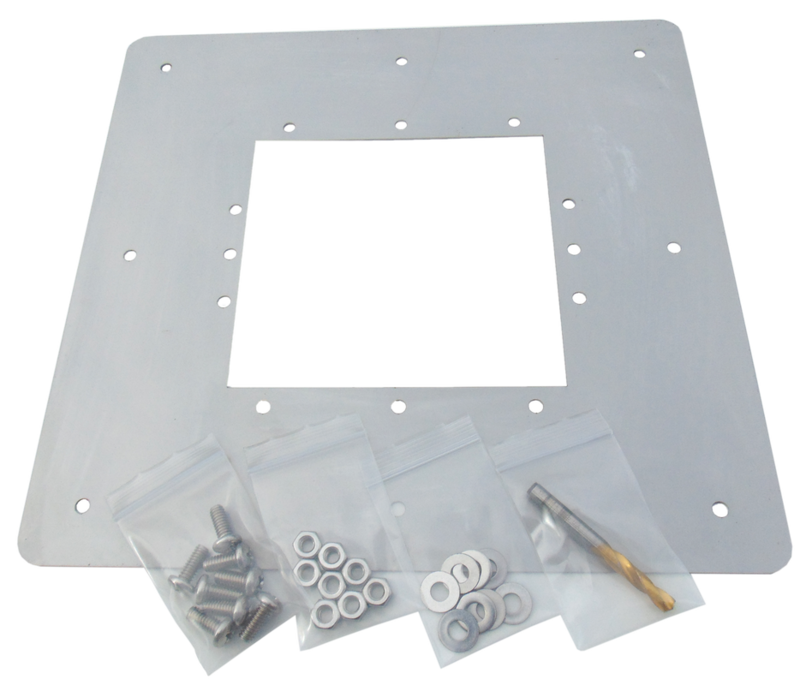 -Pre-drilled with 12 x 1/4" holes on the perimeter to allow for assembly to your pool. Fits the same skimmers as our wide mouth panel, but 8.75" longer on the bottom. Overall size: 18.75" wide x 21" high. 12" from bottom of opening to bottom of panel. -​Compatible with Hayward SP-1091WM Dyna-Skim and Hydrotools 8939 wide skimmer. -Pre-drilled with 24 x 1/4" holes on the perimeter for assembly to your pool. 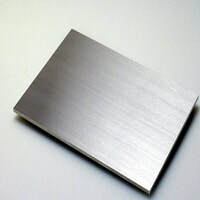 Stainless Steel repair panel for Doughboy style pools with vacuum port. -Predrilled with 12 x 1/4" holes on the perimeter for assembly to your pool. 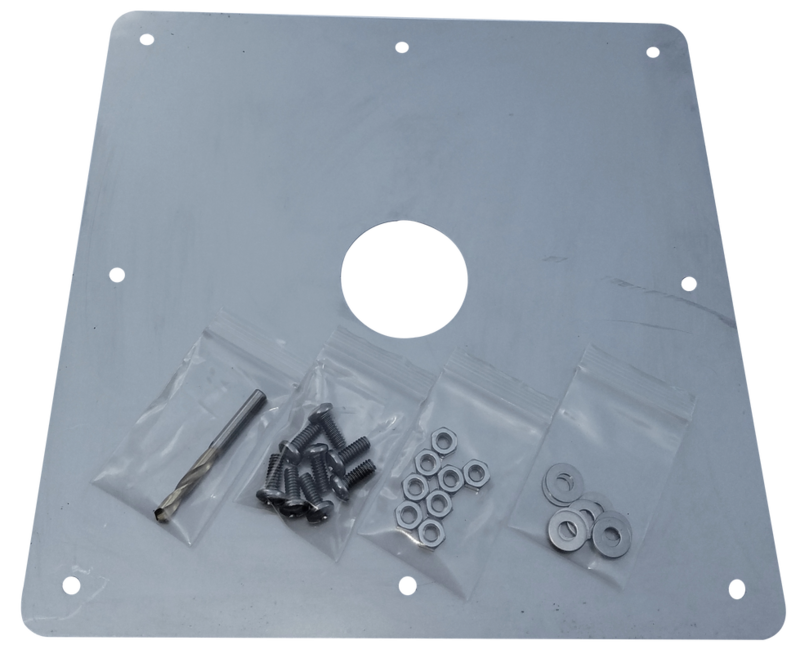 Larger 12"x12" version of our water return pool wall repair kit for wall repairs around the water return fitting: 2 3/8" thru hole for the most popular sized outlet fitting. Please contact us before ordering. Freight varies based on location and desired delivery time. 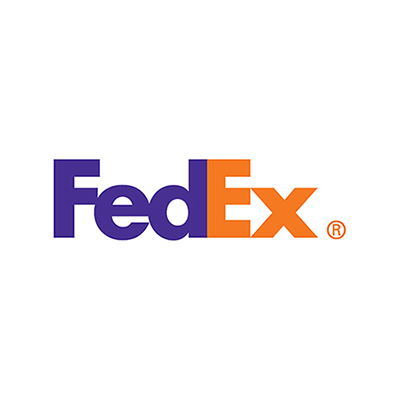 FedEx Ground or UPS based on best time for cost. Please contact us before ordering to discuss options and cost. Freight varies based on location and desired delivery time.